Sidelobe Level is information how large (or small) are side lobes in the radiation pattern of an antenna. Usually they are compared to the maximum level of the mainbeam, and the difference is expressed in dB. So for example, if SLL has the value of -20 dB, it means that the maximum level of side lobes in the radiation characteristic is attenuated by 20 dB, compared to the main beam. 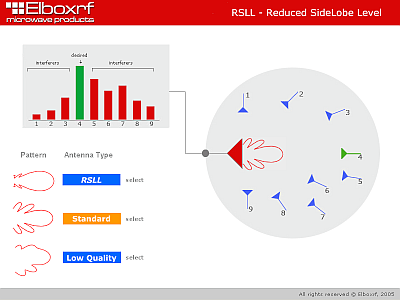 Elboxrf pioneered the use of low SLL technique in microstrip antennas for WLAN application since 2004, to put microwave networks performance on the higher level than usual products available on the market. The picture shows a pattern of wrong developed antenna. The main beam is not clean, various sidelobes can be seen. A symmetric pattern for correctly developed directional antenna. The level of back lobes is on the order of 14 dB below the maximum radiation of the main beam. The current that feeds every radiation element (the "patch" in the microstrip design) in the antenna, has the same amplitude and phase. 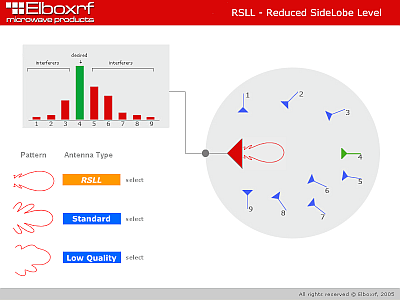 The radiation pattern of this R SLL directional antenna is symmetric and the level of sidelobes is about 20 dB below the main beam. Each element is excited by the current with the same phase and weighted amplitude. R SLL animation. The trained eye will see that the main beam is slightly broader than that for equally feed elements of the antenna. It's also means that the R SLL antenna has a slightly lower gain, but because the important measure for a radio communication systems is a Signal-to-Noise Ratio (abbreviated SNR or S/N), this loss of the gain is lower than reduction of noises (interferences), so the S/N for R SLL antenna is better than for the standard design. Because an antenna works in the real environment, it usually sees many manmade and natural sources of background noise like a thermal noise from the ground, cosmic noise, sun, lightnings, discharges and so on. So that the microwave power delivered to the radio will be the desired signal and noises collected from various sources. Noise may be received through the main beam of the antenna pattern and through sidelobes. We have a very little chance to suppress noises received through the main beam, but we can to control the level of highly undesired sidelobes. The series of R SLL antennas have the sidelobes level reduced by no less than a 20dB compared to the main beam. 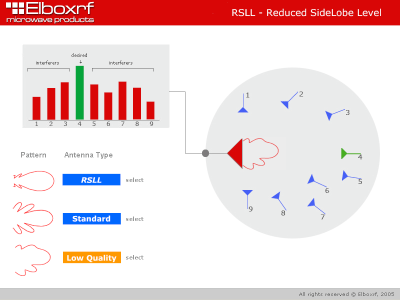 It means that the R SLL antenna will receive much less noise and undesired microwave power from other WLAN subscribers than a standard antenna.